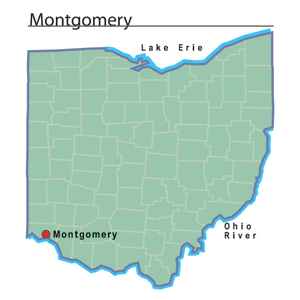 First settled in 1796, the community of Montgomery is a suburb of Cincinnati in Hamilton County. In the early days of the Northwest Territory, the area was too dangerous for white settlement because of American Indian attacks. General Anthony Wayne's defeat of American Indians in 1794 encouraged farmers to begin moving to the region. Several families from New York moved to Montgomery, and named the small village after their former home in the East. The town was a coach stop on the Cincinnati-Zanesville Road, later known as the Montgomery Pike. In addition to two taverns, Montgomery also had a gristmill and a carding mill to process local agricultural products. In spite of the arrival of railroad lines in the 1880s, the community remained small throughout the first century and a half of its existence. It was not until the 1960s and 1970s that the population really began to grow as people working in the nearby city of Cincinnati settled in Montgomery.